Tortang Sardinas, Sardine Omelet, is one of my favorite breakfast dish, it is usually made up of any type leftover sardines. For this dish I drained the sardines off from its sauce and keep aside for other use. (I poured it over on a hot garlic fried rice.) The dish is cooked in the same method with my previous torta dish. Roughly flaked sardines are sautéed with garlic and onion then mixed with beaten eggs. Here is the recipe. Separate the sardine meats from the sauce (reserve sauce for other use), coarsely flake the sardines and keep aside. In a pan sauté garlic and onions, add in the flaked sardines and stir cook for 2 to 3 minutes or until most of the liquid has evaporated. Remove from pan and place in a big bowl. Pour in the beaten eggs and mix thoroughly. Season with salt to taste. Heat oil in same frying pan, when it start to smoke lower heat to medium low heat and pour in omelete mixture, pan fry mixture for 3 to 5 minutes or until it solidifies, keep covered, then lower heat to low continue cooking covered for another 5 to 10 minutes for the inner portion of the omelete to be cooked. 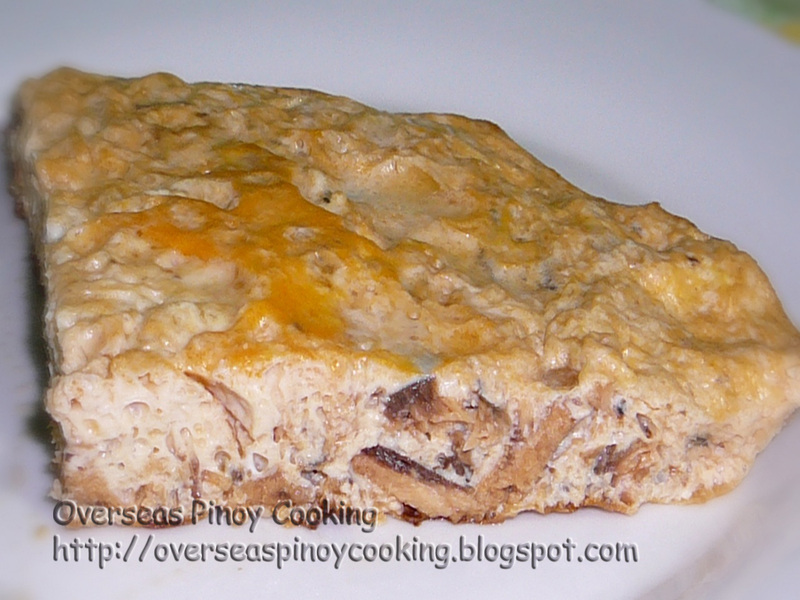 (Alternate way to cook the inner portion without burning is to transfer the semi solidified omelette in tempered glassware and continue cooking in the microwave for 2 to 3 minutes at medium to high or bake in oven). Serve with fried rice. i am so glad you have put this recipe up here, i have eaten this in spain and keep meaning to find a recipe for it. It is fantastic for breakfast. pwedeng gumamit ng aluminum sa turbo, pero di ko po natry pa kong paanong gumawa ng lasagna, siguro takpan lang yong tray ng aluminum foil para hindi masyadong masunog.